Making something creative for a get together party or kids party is a challenging task. 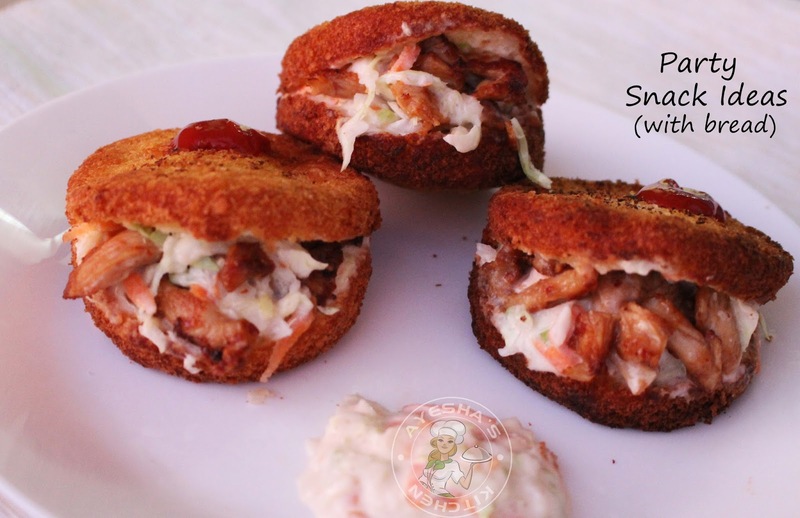 This easy but creative snack will attract the crowd for sure. 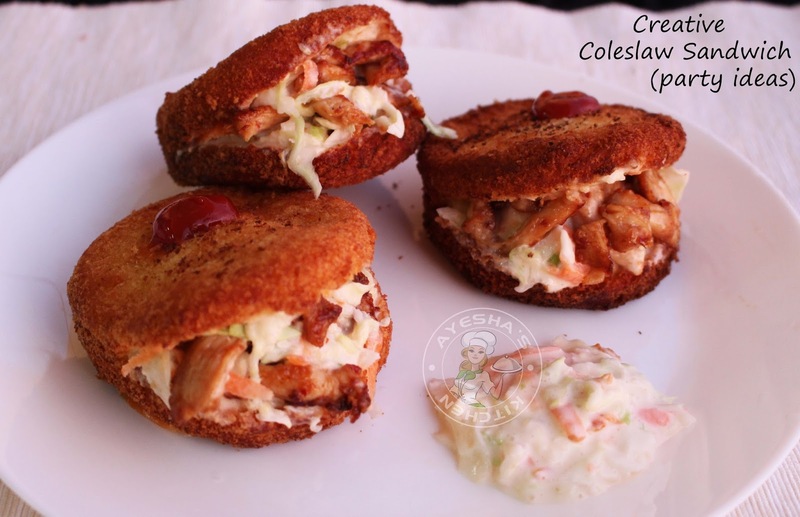 I named this pretty snack as Coleslaw sandwich, just because of the stuffing only. I always love simple but inviting snacks and this party snack idea is irresistible for kids. As long as the snacks are made of healthy stuffs, snacking is a good thing in my concept. Especially for kids. Here is the recipe showing how to make party food ideas for kids /creative snacks for kids /coleslaw sandwich / creative snack ideas / snacks with bread. First we can prepare the creative sandwich bread. For that, cut each bread slices into discs or round pieces. You can use round shaped cookie cutter or any lids for this purpose. The sides of bread so discarded can be used for making bread crumbs (make them into fine powders using a dry grinder). Set aside. Take two bread discs, one above the other . Dip it in the egg mixture and then coat it with bread crumbs well. Heat oil in a wok or a pan and deep fry over a medium flame until both sides are golden. It will take around 2 - 3 minutes only. When done, drain it to a tissue paper or paper towel, which is a must. Set aside. Now make the filling / stuffing. Wash the chicken strips or chicken cubes well and marinate it with soy sauce, garlic paste, salt and cornflour (if u need crispiness). You can do the marination with your favorite marinade also. Heat a pan with oil and shallow fry those marinated chicken pieces until done. 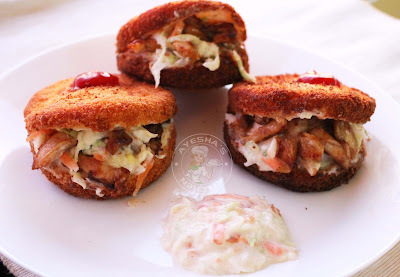 Now make a small slit on the fried bread slices with a knife. Fill 2 tbsp Coleslaw and then add few pieces of fried chicken. Garnish with tomato ketchup. Enjoy. Blend well with a spoon or whisk well. Mix gently until well combined.